Directions: Shake can well. Wash and dry vehicle thoroughly. 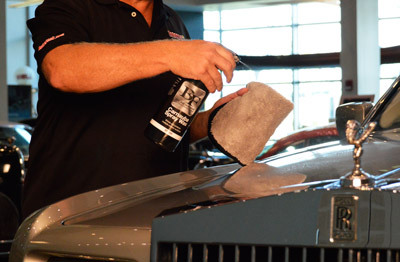 Spray BLACKFIRE Carnauba Spray Wax on to a section of paint and buff it off with a microfiber towel. Do not apply in direct sunlight to hot surfaces or on extremely cold days. 32 oz. Easy to apply and no streaking on my silver Opti-sealed Infiniti. Left the paint super slick. Shine was nice but was expecting more after reading all the hype on this product. It did look better the next morning after it cured. For the price I was a little disappointed. I have other spray wax products costing nearly half the price, that deliver a better shine. Maybe it would look better if I had used a Blackfire sealant.